Pikachu, I Choose You! It surely brings back a barrage of memories! To preserve those cherished, childhood memories for ages to come, Niantic developed the most popular mobile game, Pokémon Go! You must have played it with your friends, family or completely solo, like a lone wolf. Needless to say, you might have bumped into a pole or two while playing it. It truly has made a long-lasting impact in the Augmented Reality (AR) industry with its lifelike and mindboggling gameplay. But no matter how astounding this AR game may be, you can’t ignore the fact that it comes with a price that not every user can afford. And, the price is, YOUR PRIVACY! If you are a privacy-conscious user, you might have tried to delete the app from your device. Removing it from the device wouldn’t do you any good, except that it would keep you away from the mortal dangers. The only way to keep your data from going into the wrong hands is by learning how to delete Pokémon Go account or profile for good. Read on to learn more about the complete tutorial on account deletion and the additional measures to protect your privacy. Pokemon Go Profile: Why Should You Delete It? How Your Personal Identifiable Information (PII) Can Be Compromised? Privacy is not only a hot topic of the century but a genuine concern of billions of people connected to the digital space. And Pokémon Go is just another cog in the gear that has escalated the concerns to another level. For starters, it isn’t the company alone that might take advantage of your data. There are also third-party developers involved in creating fake Pokémon Go apps to lure in unsuspecting users. Secondly, and more importantly, there are the troublesome data collection policies designed by the company. It collects and stores, your name, date of birth, Google email id, Facebook email id, and your Pokémon Trainer Club id. If you are creating the account on behalf of an underage kid, you would have to supply the company with added information like the first and last digits of your social security number. How Your Personal Identifier Information (PII) Can Be Compromised? With a heavy volume of user data out there like a sitting duck, there’s no way a cybercriminal – opportunists included – would leave it untouched. For starters, hackers are already adept at breaching the location trackers on the device to pinpoint the actual location of any user. Secondly, the game continuously uses the camera to deliver the AR gameplay. As a result, the mechanism has a potential capability of recording the users’ video, which any notorious cybercriminal would be able to hack with ease. Moreover, the developer and the company have the complete rights to use the information as they see fit. For instance, in case of a merger or acquisition, the company would probably handover the treasure trove of data without betting an eye. There’s also a potential risk of Distributed Denial of Service (DDoS) attacks. In fact, the data center of the gaming platform had been DDoSed in the past by two notorious hacker groups. One group even claimed that they attacked it to show the weak security of the servers and they would do it again if the vulnerability isn’t fixed. With so much at stake, there’s no other choice left for you but to erase Pokémon Go profile and prevent getting your data “abused” by cybercriminals. 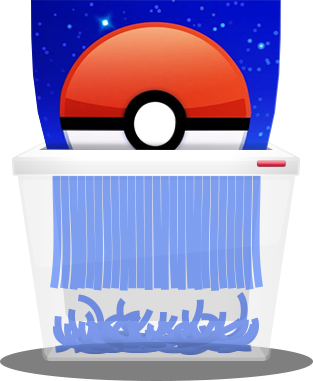 Erasing the profile and account of Pokémon Go isn’t as straightforward as you’d expect from other services, i.e., there’s no “delete account” button. To remove the account, you would be required to fill out the delete request form, which is available on the official support website. Once you fill out and submit the form, it would take a few weeks to get processed. After the approval, all your data will be removed permanently. As a result, you would need a new id should you wish to play the game again in the future. Since privacy is and always will be the major concern for such drastic steps, deleting one application won’t stop intruders or cybercriminals, for that matter. It is always recommended to take added necessary measures to protect your privacy such as installing a VPN (Virtual Private Network). PureVPN arms you with the power of military-grade encryption and absolute anonymity. With our 256-bit encryption technology, you are guaranteed to get maximum data protection against every forced or unauthorized access. Plus, with the added anonymity features and functionalities, you will be able to keep all types of privacy breaches at bay. So, get PureVPN and secure your data as well as your privacy once and for all!